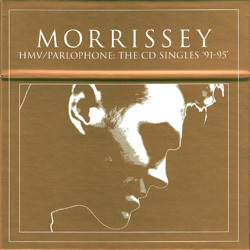 The box set contains Morrissey's 9 remaining cd-singles released by EMI in the UK: "My Love Life", "We Hate It When Our Friends Become Successful", "You're The One For Me, Fatty", "Certain People I Know", "The More You Ignore Me, The Closer I Get", "Hold On To Your Friends", "Interlude", "Boxers" and "Sunny". Compact discs are found in slipcases instead of the original thin jewelcases. Click on titles above for more information about the original releases and their respective artwork. Take note that the "We Hate It When Our Friend Becomes Successful" cd-single in this box set includes a live version of "Pregnant For The Last Time" which originally was only on the UK 12" or the USA 12" and cd-single. Also, "Hold On To Your Friends" includes both the 7" mix and extended version of "Moonriver". The 7" mix was originally only available on the 7", while the cd-single only included the extended version. The packaging for the latter cd-single in the box has a gatefold sleeve repeating the gatefold 12" sleeve artwork instead of the regular slipcase as for others cds in the box. Another box set of cd-singles, this one covering the years 1988-1991, was released earlier in the year. For more information, see "The CD-Singles 88-91" box set. All the material from these two box sets was released in 2009 on a 3-cd set titled "HMV/Parlophone Singles '88-'95". Similar box sets of 7" singles instead of cd-singles were released in 2009. For more information, see "The 7" Singles 88-91" box set and "The 7" Singles 91-95" box set. Morrissey, photographed by Anton Corbijn. The photo originally appeared inside the "Viva Hate" cd booklet. A special EMI promo cd was sent to retail for instore play. It featured 17 songs from this box set and its companion "The CD-Singles 88-91". 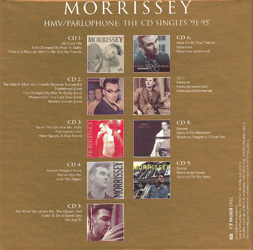 An EMI various artists promo cd intended for radio featured one song from each box-set.